NEW YORK (AP) -- President Donald Trump defiantly blamed "both sides" for the weekend violence between white supremacists and counter-demonstrators in Virginia, seeking to rebuff the widespread criticism of his handling of the emotionally-charged protests while showing sympathy for the fringe group's efforts to preserve Confederate monuments. In doing so, Trump used the bullhorn of the presidency to give voice to the grievances of white nationalists, and aired some of his own. 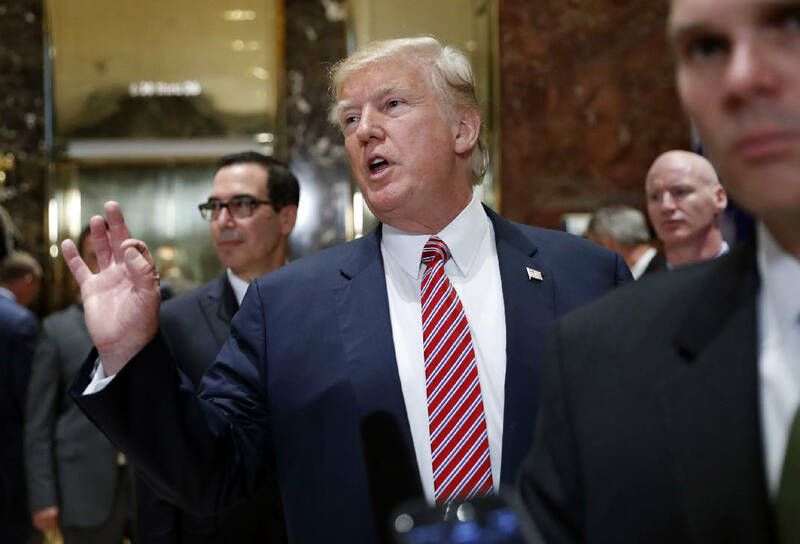 His remarks Tuesday amounted to a rejection of the Republicans, business leaders and White House advisers who earlier this week had pushed the president to more forcefully and specifically condemn the KKK members, neo-Nazis and white supremacists who took to the streets of Charlottesville. The angry exchange with reporters at his skyscraper hotel in New York City laid bare a reality of the Trump presidency: Trump cannot be managed by others or steered away from damaging political land mines. His top aides were stunned by his comments, with some - including new chief of staff John Kelly - standing by helplessly as the president escalated his rhetoric. Standing in the lobby of Trump Tower, Trump acknowledged that there were "some very bad people" among those who gathered to protest Saturday. But he added: "You also had people that were very fine people, on both sides." The rally was organized by white supremacists and other groups under a "Unite the Right" banner. Organizers said they were initially activated by their objections to the removal of a statue of Confederate Gen. Robert E. Lee, but the larger aim was to protest what they saw as an "anti-white" climate in America. In his remarks, Trump condemned bigoted ideology and called James Alex Fields Jr., who drove his car into a crowd of counter-protester killing a 32-year-old woman, "a disgrace to himself, his family and his country." But Trump also expressed support for those seeking to maintain the monument to Lee, equating him with some of the nation's founders who also owned slaves. "So, this week it's Robert E. Lee," he said. "I noticed that Stonewall Jackson's coming down. I wonder, 'is it George Washington next week and is it Thomas Jefferson the week after?' You really do have to ask yourself, where does it stop?" He continued: "You're changing history. You're changing culture." The president's comments effectively wiped away the more conventional statement he delivered at the White House a day earlier when he branded the white supremacists who take part in violence as "criminals and thugs." Trump's advisers had hoped those remarks might quell criticism of his initial response, but the president's retorts Tuesday suggested he had been a reluctant participant in that cleanup effort. Once again, the blowback was swift, including from fellow Republicans. Sen. Marco Rubio of Florida said Trump should not allow white supremacists "to share only part of the blame." House Speaker Paul Ryan declared in a tweet that "white supremacy is repulsive" and there should be "no moral ambiguity," though he did not specifically address the president. Some of the president's comments Tuesday mirrored rhetoric from the far-right fringe. A post Monday by the publisher of The Daily Stormer, a notorious neo-Nazi website, predicted that protesters are going to demand that the Washington Monument be torn down. Trump's handling of the weekend violence has raised new and troubling questions, even among some supporters. Members of his own Republican Party have pressured him to be more vigorous in criticizing bigoted groups, and business leaders have begun abandoning a White House jobs panel in response to his comments. White House officials were caught off guard by his remarks Tuesday. He had signed off on a plan to ignore questions from journalists during an event touting infrastructure policies, according to a White House official not authorized to speak publicly about a private discussion. Once behind the lectern and facing the cameras, he overruled the decision. As Trump talked, his aides on the sidelines in the lobby stood in silence. Chief of staff John Kelly crossed his arms and stared down at his shoes, barely glancing at the president. Press secretary Sarah Huckabee Sanders looked around the room trying to make eye contact with other senior aides. One young staffer stood with her mouth agape. Kelly was brought into the White House less than a month ago to try to bring order and stability to a chaotic West Wing. Some Trump allies hoped the retired Marine general might be able to succeed where others have failed: controlling some of Trump's impulses. But the remarks Tuesday once again underscored Trump's insistence on airing his complaints and opinions. Democrats were aghast at Trump's comments. Virginia Sen. Tim Kaine said on Twitter that the Charlottesville violence "was fueled by one side: white supremacists spreading racism, intolerance & intimidation. Those are the facts." Sen. Brian Schatz of Hawaii said on Twitter that he no longer views Trump as his president. When asked to explain his Saturday comments about Charlottesville, Trump looked down at his notes and again read a section of his initial statement that denounced bigotry but did not single out white supremacists. He then tucked the paper back into his jacket pocket. Trump, who has quickly deemed other deadly incidents in the U.S. and around the world as acts of terrorism, waffled when asked whether the car death was a terrorist attack. Trump said he had yet to call the mother of crash victim Heather Heyer, but would soon "reach out." He praised her for what he said was a nice statement about him on social media. As he finally walked away from his lectern, he stopped to answer one more shouted question: Would he visit Charlottesville? The president noted he owned property there and said - inaccurately - that it was one of the largest wineries in the United States.